Provenance, authenticity and artisanal processes are transforming mainstream food-bev categories. The idea of “provenance” – having a back-story anchored in heritage and trust and perhaps made in a traditional, artisanal way – is now entering the strategies of largest companies, according to 10 Key Trends in Food, Nutrition and Health 2019, the annual trend report from New Nutrition Business. “The success of the craft beer and sourdough bread markets, which are fuelled by provenance, gives a taste of what the future will look like for many categories,” says Julian Mellentin, director of New Nutrition Business. In the UK, after years of decline, the bread market grew 4.3% in 2017 thanks to premium-priced artisanal products such as sourdough. In Canada, artisanal bread has grown 15% in four years to become a $1.12-billion market. In Spain, mass-market bakery chain Panishop earns 20% of its sales from sourdough bread alone. It’s a similar story in beer, where “craft” and “artisanal” beers are now a normal part of the portfolios of giant brewers such as Kirin, Heineken and San Miguel. The latest category to harness the power of provenance is dairy. “The success of Yoplait’s Oui yoghurt shows how connecting to the Key Trends is the surest way to increase your chances of success, even for the very largest companies,” says Mellentin. Once the market leader in the US yoghurt market, Yoplait was late to enter the Greek race and as a result still lags Chobani and Danone. But with the success of its Oui ‘French-style’ yoghurt brand, sold only in traditional single-serve glass jars, it has shown it can create a new type of yogurt based on provenance – a strategy that has proven so successful for Greek, Icelandic skyr and Australian-style yoghurt. The mega-trend of people wanting their foods to be ‘as natural as possible’. It’s made with simple, non-GMO ingredients like whole milk (Key Trend 9, Fat reborn), pure cane sugar (Key Trend 4, Redefining Sweetness), real fruit and yoghurt cultures. It contains no artificial preservatives, no artificial flavours and no colours from artificial sources. The reward for Yoplait? Oui is on track for $100-million (€90-million) in annual sales, despite selling at a 200% premium to regular yoghurt (on a price per kilo basis). And what’s more, Oui has achieved this in a year in which yoghurt consumption in the US actually fell slightly. New Nutrition Business is a research and consultancy company with an expert focus on the business of food and health since 1995. It has offices in the United States, Europe, and New Zealand and affiliates in Japan and South Korea. 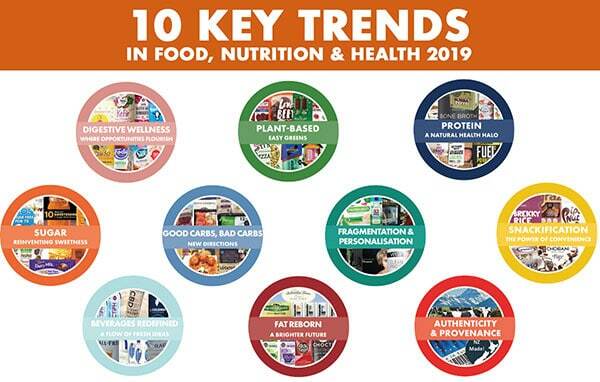 10 Key Trends in Food, Nutrition and Health 2019 is available to buy at new-nutrition.com.